This post is actually a few months old, but I stumbled on it again the other day and could help but laugh and cry at the same time. Written by a freelance computer developer, the post traces the discovery of a simply iphone/android app the government paid $200,000 to develop that is both unusable from a user interface perspective and does not actually work. It’s a classic example of how government procurement is deeply, deeply broken (a subject I promise to write more about soon). Many governments – and the bigger they are, the worse it gets – are incapable of spending small sums of money. Any project, in order to work in their system, must be of a minimum size, and so everything scales up. Indeed simply things are encouraged to become more expensive so that the system can process them. There is another wonderful (by which I mean terrifying) example of this in one of the first couple of chapter of Open Government. For those who don’t know what Tor is, it’s “free software and an open network that helps you defend against a form of network surveillance that threatens personal freedom and privacy, confidential business activities and relationships, and state security known as traffic analysis.” Basically, if you are someone who doesn’t want anyone – particularly the government – seeing what websites you visit, you need Tor. I don’t think I need to say how essential this service is, if say, you live China, Iran or Syria or obviously Egypt, Libya, Tunisia or any of the other states still convulsing from the Arab Spring. The hour and 10 minute long speech is a rip roaring romp through the world of government surveillance. It’s scary than you want to know and very, very real. People die. It’s not pretty but it is incredible. For those of you not technically inclined, don’t be afraid, there is techno-babble you won’t understand but don’t worry, it won’t diminish the experience. Another video, also from the Chaos Communication Conference in Berlin (how did I not know about this conference? pretty much everything I’ve seen out of it has been phenomenal – big congrats to the organizers). This video is Cory Doctorow basically giving everybody in the Tech World a solid reality check the state of politics and technology. If you are a policy wonk who cares about freedom of choice, industrial policy, copyright, the economy or individual liberty, this strikes video is a must view. For those who don’t know Cory Doctorow (go follow him on Twitter right now) he is the guy who made Minister Moore look like a complete idiot on copyright reform (I also captured their twitter debate here). This entry was posted in canadian politics, cool links, interesting people, reviews and tagged cdnpoli, cool links, copyright, government, interesting people, politics, reviews, surveillance, technology on January 9, 2012 by David Eaves. Been a while since I’ve done one of these. A surprising amount of reading getting done in my life despite a hectic schedule. In addition to the articles below, I recently finished Shirky’s Cognitive Surplus (solid read) and am almost done Kevin Kelly’s What Technology Wants , which, is blowing my mind. More on both soon, I hope. I got to this via Mathew Ingram of GigaOM. A few months ago there was some talk about the decline of blogs. You could almost hear the newspaper people rubbing their hands with glee. Turns out it was all bogus. This article outlines some great stats on the issue and lays out where things are at, and why the rumor got started. The sooner than everyone, from the newspaper writer, to the professional blogger, to the amateur blogger to the everyday twitterer accepts/realizes they are on the same continuum and actually support one another, the happier I suspect we’re all going to be. That’s pretty much the stand I’d like a software service to take. Basically, some good touch stones for work, and life, from someone I’ve got a ton of respect for. Awesome visualizations of the use of the words love and hate on twitter. It is amazing that Justin Bieber always turns up high. More interesting are how brands and politicians get ranked. The Neoformix blog is just fantastic. For hockey fans, be sure to check out this post. This entry was posted in cool links, reviews and tagged cool links, reviews, technology on February 28, 2011 by David Eaves. My 5 minute lightening fast jam packed talk (do I do other formats? answer… yes) from yesterday’s Gov2.0 summit hasn’t yet been has just been posted to youtube. I love that this year the videos have the slides integrated into it. As one of the more mature apps in Vancouver using open data Vantrash keeps being showing us how these types of innovations just keep giving back in new and interesting ways. In addition to being used by over 3000 households (despite never being advertised – this is all word of mouth) it turns out that the city staff are also finding a use for vantrash. 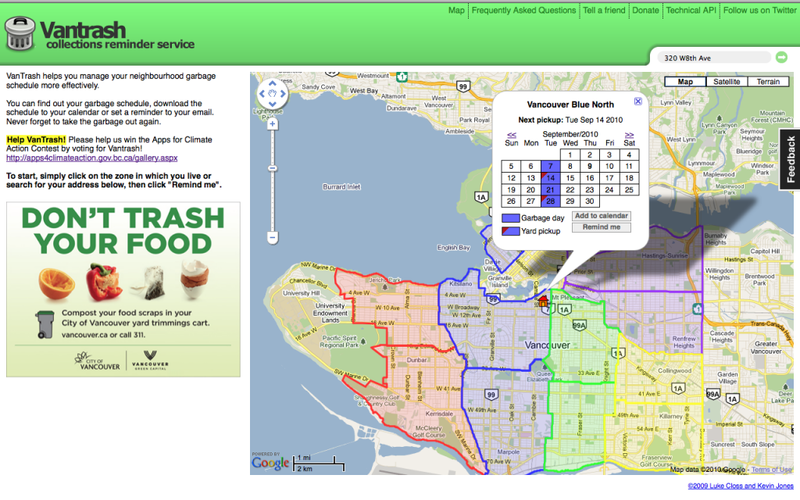 I was recently told that 311 call staff use Vantrash to help trouble shoot incoming calls from residents who are having problems with garbage collection. The first thing one needs to do in such a situation is identify which collection zone the caller lives in – turns out VanTrash is the fastest and more effective way to accomplish this. Simply input the caller’s address into the top right hand field and presto – you know their zone and schedule. Much better than trying to find their address on a physical map that you may or may not have near your station. Another interesting spin off of open data. The TaxiCity development team, which recreated downtown Vancouver in 2-D using data from the open data catalog, noted that creating virtual cities in games could be a lot easier with open data. You could simply randomize the height of buildings and presto an instant virtual city would be ready. While the buildings would still need to be skinned one could recreate cities people know quickly or create fake cities that felt realistic as they’d be based on real plans. More importantly, this process could help reduce the time and resources needed to create virtual cities in games – an innovation that may be of interest to those in the video game industry. Of course, given that Vancouver is a hub for video game development, it is exactly these types of innovations the city wishes to foster and will help sustain Vancouver’s competitive advantage. Vancouver’s Open Motion (or Open3, as it is internally referred to by staff) can be read in the city’s PDF version or an HTML version from my blog. Vancouver’s Open Data Portal is here. keep an eye on this page as new data sets and features are added. You can get RSS feed or email updates on the page, as well as see its update history. Vantrash the garbage reminder service’s website is here. There’s a distinct mobile interface if you are using your phone to browse. ParkingMobility, an app that crowdsources the location of disabled parking spaces and enables users to take pictures of cars illegally parked in disabled spots to assist in enforcement. TaxiCity, the Centre for Digital Media Project sponsored by Bing and Microsoft has its project page here. Links to the sourcecode, documentation, and a ton of other content is also available. Really proud of these guys. The Graffiti Analysis written by University of British Columbia undergraduate students can be downloaded from this blog post I posted about their project. BTA Works – the research arm of Bing Thom Architects has a great website here. You can’t download their report about the future of Vancouver yet (it is still being peer-reviewed) but you can read about it in this local newspaper article. Long Tail of Public Policy – I talk about this idea in some detail in my chapter on O’Reilly Media’s Open Government. There is also a brief blog post and slide from my blog here. Vancouver’s Open Data License – is here. Edmonton, Ottawa and Toronto use essentially the exact same thing. Lots that could be done on this front still mind you… Indeed, getting all these cities on a single standard license should be a priority. Vancouver Data Discussion Group is here. You need to sign in to join but it is open to anyone. Okay, hope those are interesting and helpful. This entry was posted in cool links, open data, public policy, technology, vancouver and tagged cities, cool links, government, innovation, open data, open government, opendata, public policy, technology, vancouver, vantrash on September 9, 2010 by David Eaves. Are you a Public Servant? What are your Open Data Challenges? A number of governments have begun to initiate open data and open government strategies. With more governments moving in this direction a growing number of public servants are beginning to understand the issues, obstacles, challenges and opportunities surrounding open data and open government. Indeed, these challenges are why many of these public servants frequent this blog. This is precisely why I’m excited to share that, along with the Sunlight Foundation, the Personal Democracy Forum, Code for America, and GovLoop, I am helping Socrata in a recently launched survey aimed at government employees at the national, regional and local levels in the US and abroad about the progress of Open Data initiatives within their organization. If you are a government employee please consider taking time to help us understand the state of Open Data in government. The survey is comprehensive, but given how quickly this field and the policy questions that come with it, is expanding, I think the collective result of our work could be useful. So, with that all said, I know you’re busy, but hope you’ll consider taking 10 minutes to fill out the survey. You can find it at: http://www.socrata.com/benchmark-study. This entry was posted in cool links, open data, technology and tagged cool links, open data, open government, technology on August 27, 2010 by David Eaves. Last week, as part of the Apps for Climate Action competition (which is open to anyone in Canada), I interviewed the always awesome Luke Closs. Luke, along with Kevin Jones, created VanTrash, a garbage pick up reminder app that uses open data from the City of Vancouver. In it, Luke shares some of the lessons learned while creating an application using open data. As the deadline for the Apps for Climate Action competition approaches (August 8th) we thought this might help those who are thinking about throwing their hat in the ring last minute. Don’t boil the ocean: Keep it simple – do one thing really, really well. Beta test: On friends and family. A lot. This entry was posted in cool links, open data, technology, vancouver and tagged cool links, mozilla, open data, technology, vancouver, vantrash on July 21, 2010 by David Eaves.